TheRugged Power Frequency Converters are also full time Power Conditioners. These units cantake any power from 46 to 440 hertz and convert it to either 50, 60 or 400 hertz power. At thesame time they regenerate the AC waveform, they regulate both the output voltage andfrequency. The unit at the left is an example of a 400 hertz to 60 hertz FrequencyConverter used on US Coast Guard aircraft. This unit also serves as a UPS allowing the useof commercial computer equipment onboard. The unit to the right is a portable FrequencyConverter designed for the Air Force. It accepts 3 phase, 400 hertz aircraft power andproduces 1 phase, 60 hertz allowing standard hospital equipment to be used on variousaircraft in emergencies. Energy Technologies, Inc. manufactures a variety of Frequency Converterproducts to transform power from 50, 60 or 400 hertz to clean well regulated power at 50,60 or 400 hertz. If you have a specific requirement, please contact us to discuss how we canprovide a highly reliable solution to your Frequency Conversion needs. 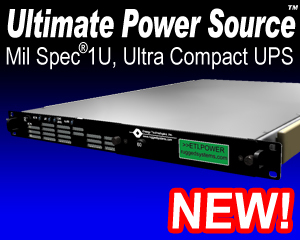 Rugged Power Rugged Rackmount or Universal Mount Frequency Converter Systems. PersonalSource Intelligent Frequency Converter Systems.